Behavioral health, including patient-focused care, motivational interviewing, care of a wide range of mental health needs, and primary care psychiatry. Future of Family Medicine concepts of the office of the future, as well as Medical Home model. Leadership skills, including team building and leadership, change management, organizational planning. Health policy and advocacy skills. Effective use of information technology. Over all three years, didactics are structured as a half-day every week on Wednesday afternoons, and are scheduled to cover the range of topics essential for practicing family physicians. Shaded areas indicate difference between two continuity clinic sites!! The first two years prepare residents for inpatient medical and emergency care, including obstetrics and pediatrics, and lay the groundwork for essential outpatient skills and practice. Residents work collaboratively on many rotations with residents from other University training programs, building relationships and taking advantage of the broad and exceptional educational opportunities. Teaching of other residents and medical students, particularly as the R2 senior on many rotations, is a bonus. The specific rotations in the R1 and R2 years are shown in the preceding table. The differences between educational experiences of the Northgate-based and Harborview-based residents are highlighted with the educational content being identical. 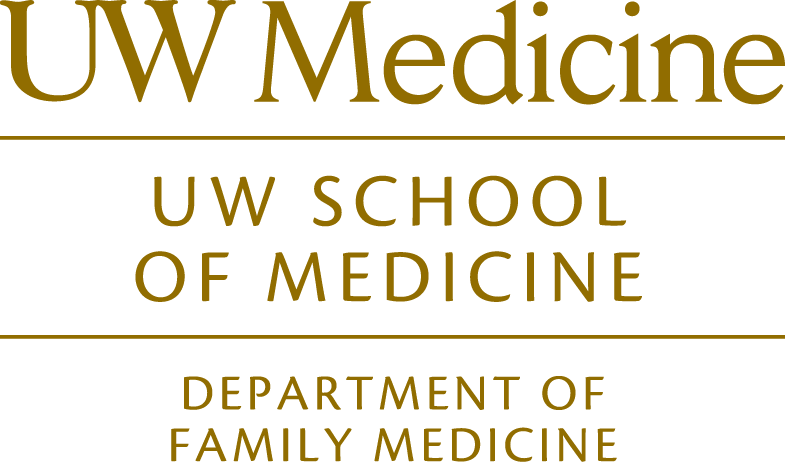 Our Family Medicine Inpatient Service includes both adult patients from our own practices, those of family physicians in the UW system and regionally, and obstetric patients and their newborns from those practices and a local community health clinics. Attendings supervising the Family Medicine Service are our residency Family Medicine Faculty who cover adult medicine, obstetric and newborn admissions. The R-1 Core Skills block is 3 spaced 1 and 2 week blocks ( July, Oct., and Feb.) of time devoted to enhanced orientation and integration prior to resuming R1 rotation experiences. There is also time devoted to the whole R1 class sharing outpatient learning experiences geared to providing residents family and community medicine expertise early in their residency career. In the R-2 year, the Family Medicine Community Practice Selective (CPS) places residents in a full-service primary care practice in either rural or urban areas where excellent family medicine care is provided and modeled. The resident is embedded in a community to gain insight into components of a future practice they plan to join. R-2 Women’s Health/Reproductive Health/Family Planning Rotation: We are committed to training our residents in comprehensive reproductive health care which includes medication and aspiration abortion, miscarriage management, and contraception. All residents participate in didactics and clinical rotations, with an opt-out curriculum available. Research opportunities are also available with family planning faculty in the Family Medicine and OB/Gyn departments. The third year intensively focuses on the Family Medical Center continuity clinic practices, building on knowledge and skills already gained and carrying them to new levels through focused learning sessions, longitudinal application and intensive seminars. Outpatient rotations take advantage of a number of specialty clinics that address common primary care problems, such as Dermatology, Geriatrics, Gynecology, Psychiatry, outpatient Pediatrics and Adolescent Medicine. Prenatal care in an urban under-served community health clinic, NeighborCare at Columbia City. Outpatient pediatrics, working with community pediatricians and adolescent health care providers. Outpatient procedures, including colposcopy, flexible sigmoidoscopy, and vasectomy, in addition to the full range of dermatologic, orthopedic, and gynecologic procedures included as part of everyday practice. Outpatient services within our Family Medical Centers, including nutrition, sports medicine and psychiatry. Specialty clinics in geriatrics, palliative care and long-term care. Longitudinal care of nursing home patients and home visit care. Advanced practice seminars in behavioral medicine and practice management education. Skills for all residents in academic focus pathway topics: health policy and advocacy, teaching, leadership, and research. Inpatient skills are maintained and honed through 1/2 month of Family Medicine Service day time senior resident, ½ month of Family Medicine Night Float and occasional coverage of the Family Medicine Inpatient Service and weekend night float, including supervision and teaching of the R1 on the Service. See where our residents train on Google!